The invention of the Worlds best Smallmouth Bass Jig came about as have so many other products, because necessity is the mother of invention. In this case the need was for a jig that could swim naturally and horizontally in the water column while being compatible with a wide variety soft plastic lures. In the early 1990’s, I discovered that Smallmouth Bass in the Great Lakes would readily hit grub tails that swam horizontally. Yes, there were many lures that would attract these fish, but nothing was easier to use, more consistent throughout the seasons, and was more adaptable than a jig tipped with a soft plastic grub tail. Simply put, this presentation worked more effectively than anything else. The problem that existed was that standard weight-forward jigs, like ball jigs and power heads, didn’t fit the bill for “swimming” plastics horizontally. Someone needed to build a jig specifically suited to this application. That someone was Joe Puccio, co-owner of Bait Rigs Tackle and an expert jig designer. Joe saw the presentation that I was using and we immediately started designing a jig to suit the application. Joe utilized the basic design of the original weight-centered Slo-Poke Jig™. The jig featured a forward eyelet with the lead distributed evenly along the entire length of the shank. With the eye in the front of the jig, rather than on the top, combined with a long thin body, now made it possible to insert the jig completely inside a plastic body. In addition to giving the bait a soft feel, the weight distribution was perfectly balanced, to keep the jig in a horizontal position. After several prototypes were produced and tested, the final version of the GrubMaster was introduced and it is the perfect jig for swimming plastics. The final design included a small keel at the rear of the shank that doubled as a keeper. 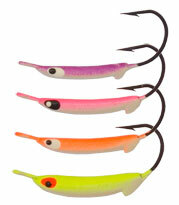 This improved the jig’s ability to run in an upright position, keeping the hook out of snags and improving hook sets. Joe also added another innovative and important feature to the GrubMaster series, a color enhancing system. This system takes advantage of the jigs ability to be inserted completely inside a plastic body. By using some very brilliant colors on the GrubMaster, the jigs vibrant hues will shine through and combine with the translucent color of plastic bodies. This phenomena creates an all new approach to fine tuning colors to match the hatch or fine tune a bait fish pattern. The Bass angler now has the ability to combine and contrast jig color and plastics to create an infinite number of color patterns. Let’s take a closer look at the advantages of the GrubMaster Jig as compared to conventional designs. As a professional guide I have observed that minnows and small fish are beyond a doubt the preferred choice of most game fish. Fishing catalogs will show pages of minnow imitating baits in all shapes, sizes, colors, and type. If you’ve ever closely watched a minnow swim through the water, it does so by wiggling its tail. Minnows are soft to the touch, and in most cases natural in color. Inserting a GrubMaster into a grub tail will do the very best job of imitating the action of a swimming minnow. The soft bodied GrubMaster has a natural bait fish feel and the tail wiggles behind the body with both flash and vibration. Contrasted this to a hard bodied crank bait, where the entire body wiggles instead of just the tail section. GrubMaster’s have a soft and natural feel when tipped with a plastic grub, tube, craw or lizard and exhibit a more natural subtle action. This is what triggers fish, especially under tough conditions! Another advantage of the GrubMaster is its versatility. Changing or fine tuning colors is as simple as matching both jig and grub to the preferred bait fish. It is easier and cheaper than changing a crank bait, which may cost anywhere from $5.00 to as much as $20.00. The GrubMaster is also versatile in depth control. Adjustments in depth can be made in several ways. One method is to simply vary the weight of the jig. For shallow water, use light jigs in the 1/16 and 1/8 oz. range. For deeper water, use the 1/4 oz. version. When fishing river systems go with the heavier weights and long line the bait so it can tick the bottom and swim in the current. This method is deadly on Bass and Walleye. The other method of depth control is to vary the retrieve speed. The faster you reel, the higher it runs, a slower retrieve allows the bait to run deeper. A stop and go retrieve will allow the bait to run even deeper. Let’s discuss the fundamentals for using the GrubMaster. Coined with the name, Insert Jig by In-Fisherman Magazine, the GrubMaster is very simple to rig. Simply insert the jig from the point of the hook, pushing the jig down the center of the plastic body and exiting at the rear. This places the entire jig body inside the plastic. No tying and untying for rigging or poking the eye through the body. There is one trick however. All plastics have a “seam” or center-line. Following the “seam” from entry to exit when putting the plastic on the jig. This will insure that the bait will run straight and true. Presentation of the GrubMaster is simple. Most of the time I just throw it out and reel it in with a moderate retrieve speed. Increasing or decreasing reel speed will change the depth. GrubMaster’s work well on the bottom but must be “hopped” to achieve tail wiggle when using grubs. Because the GrubMaster is weight centered, plastics will fall horizontally, which attracts bites. Another choice is using tube bodies, which can be presented very slowly on the bottom. Using a lift and drag presentation works best. The GrubMaster’s forward eye allows it to slide up and over bottom structure, unlike conventional jigs, that tend to “shovel” into rocks and other snags. Less lost jigs and more fishing time makes sense! Using a hybrid fishing line, such as Berkley Fireline, will improve “feel” of the lure and improve hook sets. Don’t forget the color enhancing feature of the GrubMaster. Use your imagination and experiment with colors. The GrubMaster remains my favorite way to fish. It is also my “confidence bait” that I have the most faith in and the method I use most. My customers comment on how easy it is to use and how well it works. Many of my clients have taken this method to their home waters and have told me it works just as well there. I have caught Smallmouth, Largemouth, Walleye, Northern Pike, Brown Trout, and Salmon on GrubMasters. The GrubMaster is the ultimate presentation, no noisy blades, no diving bills, no finesse presentation. Just subtle fish catching action. My suggestion is to try the Grubmaster on your favorite fish, on your favorite lake or river. It will become your favorite lure too.